You will drive and park for free at the Sagamore Spirit Distillery where you will embark you on the best Private tour in Baltimore! Start your tour with a 1 hour professional described and heavily interactive distillery tour of the brand new Sagamore Spirit Whiskey Distillery. Following the tour,enjoy a included whiskey tasting of all 3 Sagamore's whiskeys. 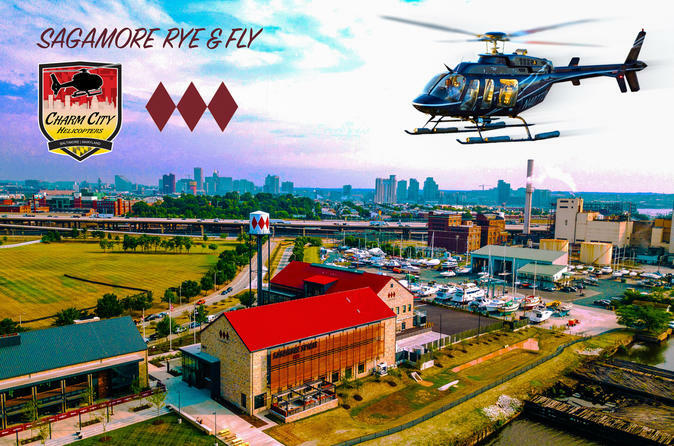 Just after, Charm City Helicopters comes to you and lands in the parking lot of the distillery and pick you up in our helicopter and give you our incredible Destination Baltimore Tour (12-15 minutes flight time). We then drop you off back off in the parking lot for a heck of an entrance to your lunch at the Co-Located Rye Street Tavern. If that wasn't enough, you will also finish with a gift bag full of high-quality Sagamore Spirit Swag as a souvenir! Truly an incredible afternoon that WILL leave you in awe!